-You’re getting a 3D printer? Why – what will you use it for? -Oh you know, it’s handy to have around when stuff around the house breaks down. Making spare parts, repairs, stuff like that. I’ve seen it lots of times. I’ve said it more than a few times leading up to when I purchased my own 3D printer. And finally it came true. Well, almost. Apparently when me and my sister, with families, visited our parents recently they felt the coffee machine needed a good cleaning. 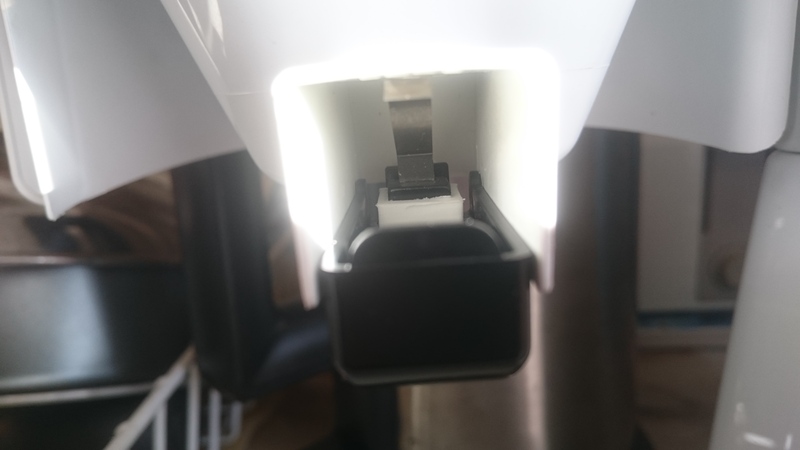 However, either because of the dishwasher or just due to age a piece of plastic holding a metal spring developed a crack – making the drip stop quite ineffective. A perfect opportunity to show how useful a 3D printer can be around the house – wouldn’t you say? It also looked quite easy – there was plenty of room around the actual plastic component to force a printed holder, a belt of sorts, onto it. After careful measurements while I was there, which turned out to be in error, followed by renewed measurements by my father, I sent the printed part by postal mail earlier this week. And tonight I got the following picture.